I might be a little over-optimistic, but I expect this academic year to be the best year of my life thus far. I started this fall semester by skipping the entire first week of classes to have an epic week with friends and family in Charlotte during the Democratic National Convention. Next semester will be just as epic: I am looking forward to returning to Barcelona in January for a month-long internship in the opera industry. Starting in February, I will spend the last semester of my undergraduate career in Berlin, Germany. Moreover, I am taking four interesting courses this semester: a government course entitled “International Conflict,” an economics course entitled “Education and Inequality,” and two German language courses. I must admit that I am already starting to feel a little overwhelmed by how much the German language has consumed my life. Despite this feeling, language acquisition and immersion are not foreign to me. In fact, two of my three majors are in foreign languages. I also undertook an entire year of undergraduate Mandarin Chinese (a GPA-breaker for some, a GPA-booster for me.) In middle and high school, I was a top student in both my Latin and French classes. The author of "Yemen: The Unknown Arabia," Tim Mackintosh-Smith, was first attracted to Yemen because of his work as a linguist. He particularly chose to engage in language study in Yemen because the local Yemeni dialect is the most similar to classical Arabic. As a linguist, his entire book is filled with interesting tidbits of information about the Yemeni dialect of Arabic. He also draws connections between the Yemeni way of speech and the country’s unique history and heritage. I knew next to nothing about Yemen when I first chose this book, so learning about its history and culture was an interesting read. I knew that Yemen was very conservative towards the role of women in society, so I assumed that Yemen had many cultural ties to its geographical neighbor of Saudi Arabia. Thus, I was surprised to hear about its unique history and development. The spread of the Yemenis over the Arab World: The author shared a story in which a taxi driver refused to accept pay because he noted that the author spoke with a Yemeni accent. He said that Yemen was the land of his grandfather, and thus, he could not accept pay. Interestingly, the taxi driver was not referring to his recent family history: There has not been a mass migration from Yemen to the rest of the Arabic world in recent years. In contrast, Yemenis were participants in the early Islam conquering armies, spreading Islam across the Middle East. 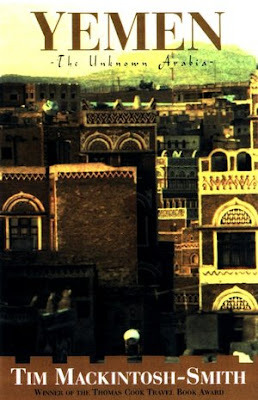 Thus, many Arabs claim to have a personal and familial connection to the Yemeni culture. Yemen was very influential throughout ancient history. First of all, it controlled the entrance to the Red Sea (which would set it on the radar map of many European colonizing powers for centuries to come), and thus, had an advantage in trade. In fact, throughout ancient times, Yemen was known as a spice producer, especially of such spices as myrrh and frankincense. It is also worth noting that Yemen was not a nomadic society like its neighbors. In contrast, Yemen was an agricultural society and was a part of the Queen of Sheba’s geographic domain. To be honest, if I had the chance to re-pick a book about Yemen, I would probably not choose this particular book. This is not because I disliked it, but rather, I have developed a greater interest in current Yemeni affairs than in the history of Yemeni society. This interest actually developed after one of my friends posted a video on her Facebook page which discusses the use of drones by the United States. In particular, this Al-Jazeera video talks about the drone strikes which have occurred in Yemen, despite the fact that the U.S. is currently not at war with Yemen. This book is pre-9/11, meaning that it was published in 2000. Thus, many recent political developments are not included in this book. The book does delve into some political matters, including the unification of North and South Yemen in 1990. However, I would like to know more about recent Yemeni political developments. Based on some quick research I did following the reading of this book, it is evident that the Arab Spring of 2011 had significant effect on Yemen. Also, as of February 2012 the US Department of State has issued a Travel Warning to anyone wishing to visit the country.